The new gameâ€™s spectacular story promises to be a fun backdrop to the colorful cast of Disney characters making their 3-D debut on a handheld title. In addition to new worlds, Kingdom Hearts 3D [Dream Drop Distance] will feature never-before-seen gameplay elements for the series. â€œWith the tenth anniversary of the series on the horizon, the current Kingdom Hearts saga is approaching its climactic conclusion. The story of this game will serve as the opening chapter of the final conflict, and, as always, will be full of surprises. In order to best implement this element of surprise and discover new realms of possibility, we have chosen Nintendo 3DS as our platform. With its revolutionary new game system, this title will not only be a bold, exhilarating tale of adventure, but also a first look into the future form of the Kingdom Hearts series,â€ said Tetsuya Nomura, director Kingdom Hearts 3D [Dream Drop Distance]. Kingdom Hearts 3D [Dream Drop Distance] Title Announcement that have never been seen before. If they can successfully complete the task they are given, they will be deemed true Keyblade Masters. 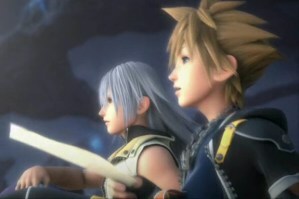 â€¢ Dual protagonists â€“ Play as the two most popular characters of the franchise, Sora and Riku. â€¢ â€œFree-flowâ€ action â€“ Enjoy fast and effortless movements while interacting with the environment and performing acrobatic attacks. â€¢ Brand-new creatures â€“Dream Eaters inhabit the Sleeping Worlds, and are split into two categories: Spirits and Nightmares. Recruit over 50 different types of Spirits as allies to fight alongside Sora and Riku. â€¢ New Disney worlds â€“Beloved Disney worlds and characters, such as La CitÃ© des Cloches (The Hunchback of Notre Dame), make their series debut. â€¢ Story progression â€“ With updated looks for Sora and Riku, and the impending conflict made clear, this title is a big step forward in the series.